Baby it is cold outside, but the C2C Fingerless gloves are wonderful way to keep those hands warm. I am just in love with the corner to corner crochet stitch. That is why I wrote the How to Corner to Corner Crochet Tutorial, complete with photo and video tutorials. If you want more crochet goodness sent directly to you inbox, subscribe to my newsletter below. The texture the Corner to Corner crochet stitch makes is absolutely beautiful. I really enjoy designing with this stitch and that is why it was so easy to design many small and medium patterns using this stitch. The C2C Fingerless Gloves is one of my C2C practice patterns. 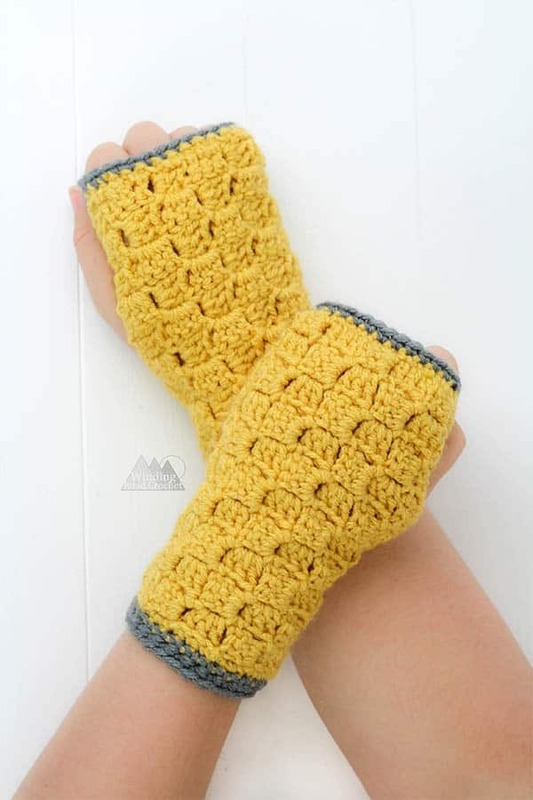 I wanted to design a series of pattens that were small to medium crochet patterns that would help crocheters practice the Corner to Corner Crochet stitch. I have also created a series of small C2C crochet graphs that are great first projects for trying out tapestry Corner to Corner projects. All my C2C designs can be found here! Check out all my other Free Crochet Patterns Here and some of my favorites below. Fingerless Glove measures 8 inches around the arm and 7 inches tall. Design for a adult woman’s hand. This pattern can easily be adjusted to fit a child or man. You will be using the Corner to Corner Crochet method to create a 10×10 square, then edging the square with a single crochet border in the main color. For a man’s size crochet a 12×12 square. R2-10: Ch 6, Dc into the 4th, 5th, and 6th chain from the hook. (Slst to the turning chain of the previous row, Ch 3, Work 3 Dc around the turning chain you Slst to.) Repeat from (to) to the end of the row. NOTE: Before you start decreasing make sure Row 14 on one edge is able to almost completely wrap around the center of your forearm. We will add another half inch of width with the Single Crochet border. If it is too big or too small, add and subtract rows as needed. R11-19: Turn, Slst to the last 3 Dc of the previous row, Ch3, turn. Work 3 Dc around the turning Ch of the previous row, *Slst to the next turning Ch, Work 3 Dc around the turning Ch of the previous row,* repeat from *to* until you are even with the top of the previous row. To make the gloves easier to sew together you will crochet a Single Crochet border around the edge of the square. Using a yarn needle and yarn, use a running stitch to sew the sides of the fingerless gloves together using the diagram below. Check out my video tutorial Sewing for Crocheters if you need any guidance on sewing. You will sew 1.5 inches from the top go the gloves and then 3.5 inches from the bottom of the gloves. This will leave a 2 inch opening for your thumb. Adjust sewing measurements as needed for a man’s or child’s size. In order to add just a bit more length and a little extra detail I crocheted a row of single crochet around the top of the gloves and two rows of single crochet around the bottom of the C2C Fingerless Gloves. R1: Slst to a Sc close to the 1.5 inch seam you sewed, Ch1, Sc in each stitch around, Slst to first Sc, Fasten off. R1: Slst to a Sc close to the 3.5 inch seam you sewed, Ch1, Sc in each stitch around, Slst to first Sc. R2: Ch1, turn, Sc in each stitch around, slst to the first Sc. Fasten off. Weave in all your ends and your Fingerless gloves are complete. Are you going to make the C2C Fingerless Gloves? I would really like to see your finished crochet project, take a picture and share it with me on any social media! Just tag me @windingroadcrochet, #windingroadcrochet, or #ourcrochetjourney. Join my Facebook Group and share your creation with the community at Our Crochet Journey Facebook Group! Written pattern, tutorials, graphs and pdfs of the C2C Fingerless Gloves are copyright Windingroadcrochet.com. Please do not reprint or repost this content as your own, but please feel free to share this link with others. You can find more information on sharing my work with others in the Terms and Conditions Page. I am completely lost on decreasing. After I did first row of decreasing and start second Dec. Row. There is no ch-3 on the next row to do the 3dc into.